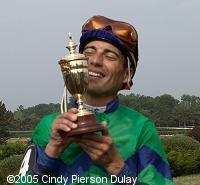 Gerry Olguin celebrates with the Prince of Wales Stakes trophy after winning on Ablo. 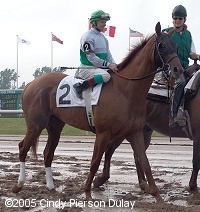 It was his first win in a Triple Crown race in Canada. 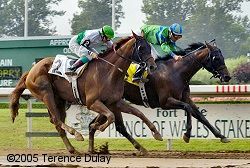 The 70th running of the Prince of Wales Stakes, the second leg of Canada's Triple Crown, was held at Fort Erie Race Track on Sunday June 17. A field of just six went to post with Queen's Plate runaway winner Wild Desert sent off as the prohibitive 3-10 favorite. 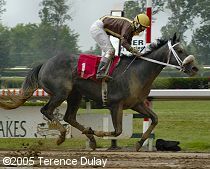 With his low odds, the short field, and heavy wagering expected from his owners, show wagering was not offered on the race. Heavy rains overnight which returned late in the morning made the main track very sloppy and deep, however the sun came out just as the horses stepped onto the track for the post parade. Along with Wild Desert, the field included 5-1 second choice Out From Africa, and 8-1 third choice Ablo. When the gate opened, jockey Gerry Olguin sent Ablo right to the front and led the field around the clubhouse turn with 16-1 shot Autumn Snow battling him to his outside most of the way around. The pair dueled down the backstretch, through fractions of 24.52, 48.13, and 1:11.76 over the deep, tiring surface, with Out From Africa giving chase in a stalking position a couple of lengths back. Patrick Valenzuela kept the favorite out of trouble in fourth early on, but was six lengths off the pace most of the way. Around the far turn, Francine Villeneuve asked Autumn Snow for run and got it, as he moved up alongside Ablo and poked his head in front with a quarter of a mile to go. The pair battled head to head for the entire stretch run, but in the final strides Ablo got his neck out in front and prevailed in a final time of 1:56.90 for the 1 3/16 mile trip. Wild Desert made a desperate four-wide rally through the lane but could only beat Out From Africa by a head for third place money, finishing 3/4 length back behind Autumn Snow. First time by with Ablo already on the lead. Favorite Wild Desert can be seen on the far left apparently jumping high with each stride to avoid the muddy track. Every shot we have from this time shows him jumping very high in each stride and sometime throwing his head back, so he obviously hated the mucky surface and probably wasted a lot of energy. 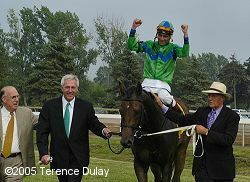 Trainer Roger Attfield (right) leads Ablo to the winner's circle along with owners Mickey Canino and Bill Werner. It was the 5th Prince of Wales win for Attfield who said, "He's a very gutsy horse. He certainly enjoyed it. When they let him get loose on the lead like that, it was just a question of whether he could stay the distance. 1 3/16 wouldn't be his best distance, I can guarantee you that, but he's just a gutsy horse. He was in very very good shape, has a lot of desire to win." 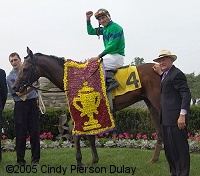 Ablo in the winner's circle with his flowers. 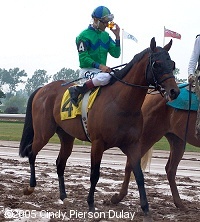 Trainer Roger Attfield said, "I think the mud helped him, even though he'd never raced on an off track before. His mother (Diablo's Closer) loved it and from what I had been told about the new surface here I thought that would help him get the distance." Attfield said he was not likely to send Ablo on to the Breeders' Stakes, but would send another of his charges instead. Ablo in the post parade before the race. Winning jockey Gerry Olguin said, "You have to play the cards as they're dealt. He went right to the front on his own and was very comfortable so I let him run. That other horse (Autumn Snow) came right up to me but my horse kept digging in and wouldn't let him by. I thought that Autumn Snow on the outside was going to get by me the whole time. Finally three jumps before the wire (Ablo) skidded past the line. Before then, I didn't feel as if I was going to win. I thought if he ran good I would be second. 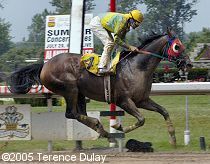 The horse was training so good and had been such a happy horse that I thought second money would be a great race for him. I was just hoping Wild Desert wouldn't show up today and he didn't." Second place finisher Autumn Snow in the post parade. Top local jockey Francine Villeneuve was aboard for the first time and nearly stole the whole thing. Villeneuve said, "It was awesome, wasn't it? I think he (Autumn Snow) may have got a nose in front down the lane. I'm not sure. It was awful close. . . . We were both yelling. . . . My horse was kind of leaning on him a little bit, he bumped him a little bit. He was just real aggressive." Beaten favorite and third place finisher Wild Desert returns after the race with jockey Pat Valenzuela looking over at the toteboard like he can't believe the results. Valenzuela said Wild Desert "kicked on very well. If it had been a mile and a quarter today, I think I would have got it. But it was a 16th of a mile too short. . . . (The track) had a good bottom and I know my horse has run well in the past in the mud. But I think today he was struggling a little bit to get through it." Wild Desert's owners had their own private betting window up in the Prince of Wales Restaurant. I hope they didn't lose all the cash they made betting on the Queen's Plate! Dan Borislow, majority owner of Wild Desert, said, "He was dropping back and I knew it would be a lot to make up on these horses today. There wasn't much class in this race but the horses that were out front and had the class carried it pretty good. That's racing. You can't use that as an excuse. The fractions were just slow." 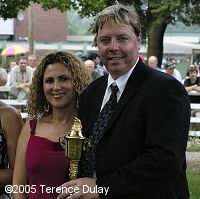 Wild Desert's owners brought their Queen's Plate trophy to the race. That was the first time I have ever seen anyone do that and I wonder if that may have jinxed them. The undercard feature was the $100,000 Ernie Samuel Memorial for older fillies and mares. 4-1 second choice Spanish Decree stalked the early pace of 6-5 favorite Tamara and 9-2 third choice Clubay, then rallied 3-wide around the turn to draw away to a 2 length win in a time of 1:44.62 for the 1 1/16 miles over the sloppy going. Tamara was second and 5-1 Miss Filibuster rallied to be third. Jockey Gerry Olguin completed a sweep of both stakes races on the card, riding both Spanish Decree and Ablo. Olguin said, "When the race came off the grass this morning, I thought I had a better chance because she's 0-for-12 on the turf. When it came up muddy, it looked like she had good form on the mud, so it wasn't going to hurt me." It was a bit of a sad thing to see 2001 Canadian Champion Sprinter and millionaire Mr. Epperson making his 75th career start at age 10 in a $12,500 claiming race. Winless in the last two years, he has been bumping down the ranks to this, his lowest ever. Although he still looks good, he finished a well beaten 6th. Hopefully he will be retired soon if all the owners can agree on it. 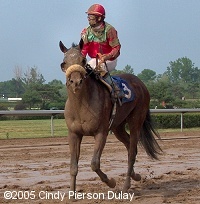 Co-owner Brian Brolley said, "He's a wonderful horse. He's earned his trip to the farm." Brolley said the decision to keep Mr. Epperson racing was made by trainer Scott Fairlie, also a 50 percent owner.